The cigar-shaped comet caught scientists by surprise when it whizzed past the sun last year. 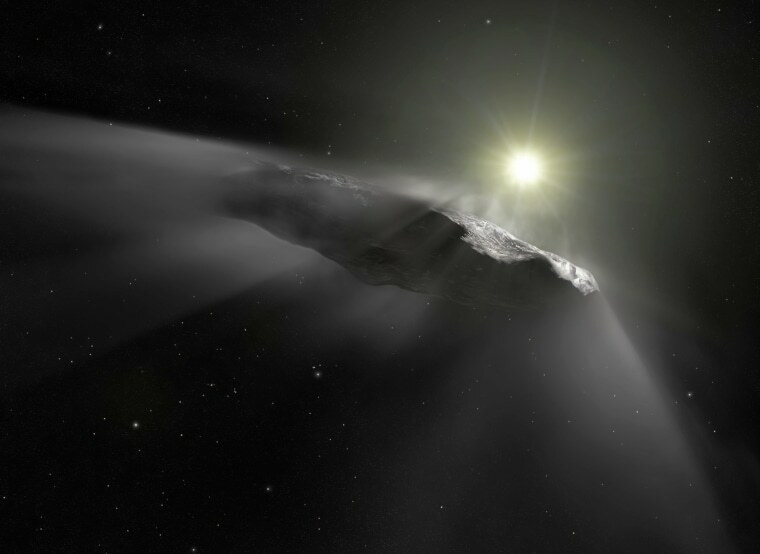 Oumuamua, the mysterious celestial object that caught astronomers by surprise when it was seen speeding by the sun last year, just became a bit less mysterious. Using new observational data from a European spacecraft, an international team of astronomers has identified four dwarf stars as possible "homes" of the cigar-shaped object — the first interstellar visitor ever observed within our solar system. "Somehow it must have escaped from that system to get to us," Coryn Bailer-Jones, an astronomer at the Max Planck Institute for Astronomy in Heidelberg, Germany, and the leader of the team, told NBC News MACH in an email. "At what point in the life of the system we do not know." The astronomers may not know for sure, but evidence suggests that gravitational forces from a giant planet in orbit around the home star ejected Oumuamua into interstellar space more than a million years ago. It's unknown whether such a planet orbits any of the stars identified in the new research, which has been accepted for publication in The Astronomical Journal. But that could change as astronomers gather more evidence about the stars. Scientists had previously tried to track Oumuamua back to its point of origin but were unable to do so. But new data from the European Space Agency's Gaia probe, a space observatory that aims to collect detailed information about more than a billion stars in our Milky Way galaxy, made the difference. "With the new data from Gaia, we have a far better picture of how far away the stars are and how they are moving, which makes this kind of tracing back much more accurate," Alan Jackson, an astronomer at the University of Toronto, Scarborough, who was not involved in the new research, said in an email. The astronomers considered 7 million stars for which Gaia has collected detailed information, along with an additional 220,000 described in the astronomical literature and — after some detailed calculations — identified four stars that are known to have come within a couple of light-years of Oumuamua between one and 7 million years ago. One is a reddish dwarf star known as HIP 3757, another is a sunlike star called HD 292249; little is known about the other two stars. Jackson said astronomers expected to find more Oumuamua-like objects with help from new telescopes, including the Large Synoptic Survey Telescope now being built in Chile. "One could imagine sending a spacecraft to visit such an object and bring back a piece of it," he said, adding that the "hypothetical rock" could tell us more about how our solar system compares to others. The new research isn't the last word on Oumuamua's origins — and not just because it fails to pinpoint which of the four stars is the comet's home. Bailer-Jones said it's possible Oumuamua came from an entirely different star that is too far away or too faint to be seen. But those limitations didn't stop other astronomers from hailing the new research. "I'm a fan of this work," Jackie Faherty, an astrophysicist at the American Museum of Natural History in New York City, said in an email. "Determining the home of Oumuamua is equatable to finding a needle in a haystack the size of Mount Everest."